A fundraising campaign to build Marpeck Commons, the library, learning commons, and bridge at Canadian Mennonite University (CMU), has reached its goal. “It is our great pleasure and gratitude to announce that the CONNECT Campaign goal of $14.4 million has been achieved in gifts and commitments,” CMU President Dr. Cheryl Pauls said during a speech she gave on Saturday, November 25 at the university’s annual Christmas concert. Plans for Marpeck Commons started taking shape in 2009, when leadership at CMU began envisioning a building that would get the university’s library out of the basement, as well as create a learning commons with light and space. The building would include a pedestrian bridge linking the two sides of CMU’s Shaftesbury campus and ensuring safe passageway across Grant Avenue. It would be a space drawing together the community within and surrounding CMU—the community of students, staff, and faculty, as well as the community of neighbours and constituents. 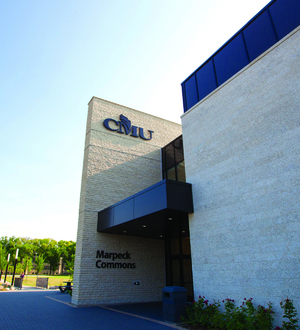 That dream became a reality when CMU opened the doors of Marpeck Commons on January 5, 2015. Since then, Marpeck Commons has had a measurable and transformative impact for CMU students, faculty, and the broader community. The CMU Library, for example, annually receives more than three times the number of visitors it received in its previous location. The building includes an inviting café, along with a bookstore and resource centre with the most extensive selection of theological resources anywhere in the province. This has been the largest fundraising campaign in CMU’s history. Nine hundred donors contributed, with 60 per cent of those contributions coming from Manitoba and 40 per cent coming from out of province. The donations included those of alumni and supporters who purchased 459 engraved bridge tiles. The volunteer leadership of the CONNECT Campaign Cabinet, a group characterized by deep generosity and vision, has been critical to the success of this fundraising endeavour. Led by campaign chair Elmer Hildebrand, CEO of Golden West Broadcasting, Ltd., the cabinet included Arthur DeFehr, Philipp R. Ens, Bill Fast, Janice Filmon, Albert Friesen, Charles Loewen, Jake Rempel, and Tamara Roehr.